Cabin class was referred to as the ” Middle Class” of the ship. Referred to in travel brochures as “Happy Medium” in Atlantic travel, offering high standards of comfort and service at reasonable rates. Typical travelers included vacationing clerics, professors, seniors, and families. With more space, comfort, and amenities passengers lived between the luxury of First and spare accommodations of Tourist. It was just the right mix for those who wanted more room and were put off by the extra appointments and perceived formality of First. Dressing up for dinner was optional, and a more informal atmosphere prevailed in the public rooms. 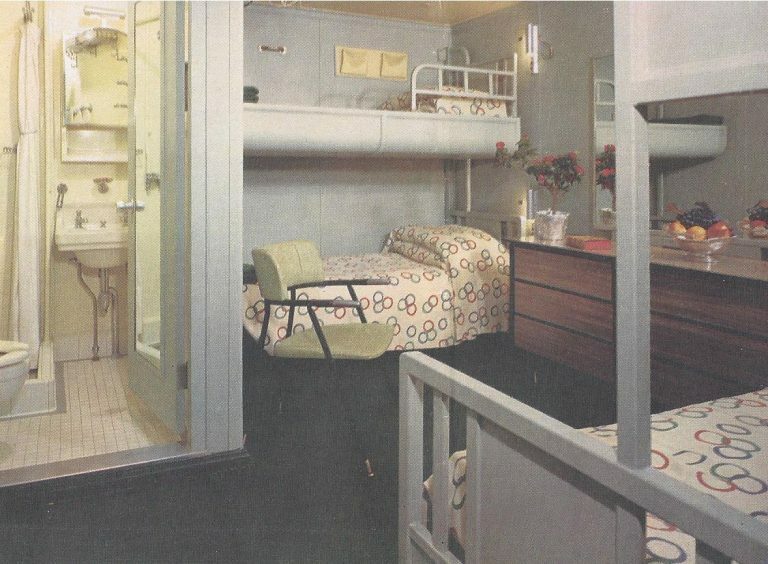 All but four staterooms in Cabin Class had a private shower and toilet. The curly maple paneled dinning room was bright and cheerful . Passengers dined beneath Hildreth Meire’s stylized murals of the skylines of San Francisco, New York, Paris and London. The smoking room came with fireplace and chairs upholstered in leather and hand woven fabric. There was room for deck games on a large expanse of Upper Deck and a glass enclosed promenade on Main deck. In this beautiful air-conditioned Dinning Room you will satisfy the hearty appetite that brisk sea air and your daily activities will stimulate. The cheerful environment makes every meal a pleasurable event – Immaculate white linen, gleaming china, glistening silver, fresh flowers and soft indirect lighting. Elaborate menus afford a wide choice of appetizing foods of the lighting. Elaborate menus afford a wide choice of appetizing foods of the highest quality expertly prepared by skilled chefs and served by trained stewards. Special menus are available for children. Tables are of varied sizes to accommodate large or small groups. Sample items available on the Gala Diner. Cabin Class. Beluga Malossol Caviar, Canape or Smoked Irish Salmon. Suggestion for the avoidance of accidents_. The following precautions are suggested for the avoidance of accidents during bad weather, particularly when the ship is pitching or rolling. 1. *NEVER*let go of the hand-rails when proceeding up or down companion ways. 2. *Always* hold on to safety ropes, hand rails or secured furniture when crossing open lobbies, going through public rooms or in the Dining Room . 3. Ladies are advised to wear low heel shoes. 4. In bad weather, do not stroll about the ship unnecessarily; remain seated in furniture that is secured. 5. When sitting in straight-back chair, brace yourself. If the chair should move while you are at your meal, hold on to the table and do not attempt to save movable utensils or equipment. 6. Avoid holding on the bathroom or other doors-the ship movement may suddenly cause the doors to close. 7. If you see unsecured baggage in your stateroom, call your steward. 8. Do not allow children to *run* or *play* unattended. 9. Use Berth Ladder to enter Upper Bed. Make certain the ladder is securely placed. 10. *Please*, do not ignore these suggestions. They are for your own safety.